Three environmental organizations are celebrating an influx of cash that will help them maintain or establish vital watershed protection programs, and conduct education and outreach in Erie County. According to a news release from State Rep. Ryan Bizzarro' s office, $1,328,573 in grants are coming to the county from the state Department of Environmental Protection's Growing Greener Program. Stateswide, DEP is awarding more than $17.3 million. Read the full release here. Pennsylvania State University will obtain $141,891 to assist the Benedictine Sisters restore five-hundred feet of Sevenmile Creek at their Glinodo Center, which is located on Lake Erie in Harborcreek Township. 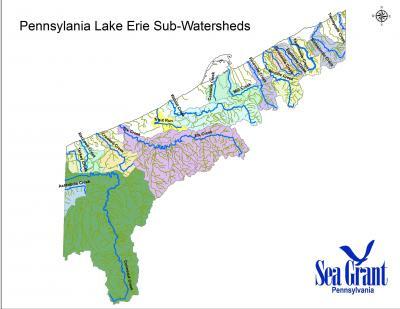 David Skellie, coastal land use and economic specialist for Penn State's Pennsylvania Sea Grant Program says that they are pleased to assist in securing state Growing Greener funding for the restoration. "Successful completion of this project will use natural techniques to move the stream toward the center of the channel," Skellie says. "This stabilizes the stream banks and increases the forested riparian buffer, improving habitat to prevent an estimated 45.6 tons of sediment per year from entering Lake Erie." He also says that the work will provide an educational tool. "We believe that restoration of the Sevenmile Stream corridor will greatly benefit the Glinodo Center as an environmental educational campus by clearly illustrating a natural means of stream restoration." To learn more about what PA Sea Grant does, go here. The Erie County Conservation District will receive $443,880 for its 2014 Agricultural Best Practices Management (BMP) cost share program. In the program, landowners are encouraged to implement BMPs on their properties that are effective and practical methods which prevent or reduce the movement of sediment, including things like manure storage, stream bank fencing, access lanes, improvements to animal-heavy use areas, and more. Bethany Fritz, Agriculture Specialist for the ECCD explains that the cost share program provides partial funding for farmers and landowners, who are responsible for a portion of the cost for the project. "This is at least the fifth grant the Erie County Conservation District has received to install best management practices on local farms. As with the other grants we hope to work with as many landowners as possible. That usually means up to ten projects depending on the type of project and the cost." Read about the ECCD's agricultural and other programming. Receiving the largest award in the county, Environment Erie, will see $742,802 for five different projects, including $41,585 for beginANEW's residential storm water education and vacant lot beautification; $190,850 for Phase 7 of the Cascade Creek Restoration project; $110,188 for Scott Run watershed protection and restoration; $366,640 for septic system improvements; and $33,539 for service learning projects, in which school groups take the lead in implementing an environmental improvement to their facility or in the community. Amy Jo Smith-Zola, executive director of Environment Erie says, "The students learn through the services that they put into effect." ​"We are very excited about the awards that will support both existing programs and new ones, says Smith-Zola. "Receiving so many awards through the competitive process is a reflection of the hard work of the staff and board at successfully implementing projects." A round-up of beginANEW and other activities of Environment Erie is here. These generous grant awards show us the wealth of environmental talent in town which will, indeed, help us grow a little greener. We should be proud.